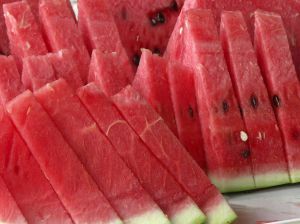 According to A Kids Heart.com, August 3 is National Watermelon Day. I can't think of a more deserving fruit to get its own day during a hot summer month. Watermelons bring back fond memories of sitting out on my aunt's porch with my siblings and my cousins seeing who could spit the watermelon seeds the farthest. I don't advocate kids spitting watermelon seeds all over. Instead, you can lead them through a watermelon craft. Cut a large triangle out of a sheet of white construction paper. If you prefer your watermelon slice to be the shape of a half circle, you could choose to cut that shape out instead. Paint the entire front and back of the construction paper red. Pink paint will also work. You'll have to wait for the paint to dry before continuing to step 3. Cut a strip of green felt to fit across the bottom of your triangle (or across the bottom of your half circle). This is the watermelon's rind. Glue into place. You'll need a strip for each side of the construction paper. Cut out several small black circle or ovals to represent the watermelon's seeds. Glue them in random places on the red portion of the watermelon. Repeat on the opposite side. Once the glue drys, you can display your watermelon for all to see. Eat a real slice of watermelon in celebration of National Watermelon Day and the completion of your watermelon craft. Knitting Doilies: Dumb Thing, Or The Dumbest Thing?